Of all the unsurprising things to happen this month, the "dnf" status on my NaKniSweMo cardigan is least surprising. But, hey, this isn't actually a race. I can still knit the sweater. It's not as though my yarn, needles, and pattern disappear at midnight. Still, it is a little disappointing to have only completed 44 rows. Yes, the rows before the increases. Oh, well. While I might currently lack the objectivity to assess what I have accomplished, I do know it has been a very full month. I'm plugging away at the laundry from our travels and trying to get ready for next month. December is nearly here, and it is never empty. As you know, we sometimes have to go to the doctor all the way down in the 'ham, and that's a bit of a drive. So, when an appointment is scheduled at the right time and we feel up to it, we like to visit Trader Joe's. It's not a store we have locally, so it is a fun treat. Now, truth be told, we mostly pick up junk food, so it's probably a good thing we aren't any closer and don't shop there more often. It's not all we buy there, but it truly is the bulk of it. At least we finally stopped buying a bottle of wine every time, because we don't drink, and we don't have much occasion to give a bottle to someone. That being said, that hasn't always stopped us. We're weird, and we know it. Some of our favorites are seasonal items. We're mental for that saltwater taffy. One of our nephews loves the firecracker bar (chocolate with something like pop rocks and spiciness) so much. That's another thing we like about going there; we can bring things back to others that they can't get otherwise. My mom has never been a tea fan, but she would like to drink tea. I made her some white ginger pear that she liked, so we brought back a box just for her. Anyway, on our last trip, we apparently went on just the right day, because the Advent Calendars had arrived. We picked up a pile for nieces and nephews, and now we can finally give them to the little ones. Here's hoping they make the countdown to Christmas more fun. There really is no place like home, and it is good to be here. We've unloaded the car, but unpacking will have to wait for tomorrow. For now, I'm sipping some tea with honey, and then it's shower and bed. Well, I don't know when this will post, as I have no innerwebs right now. All on a night when I can't sleep. Oh, the injustice of it all! Today began differently than expected and it stayed that way. We rolled with it pretty well, and then when one of the shifts in the situation renewed itself, we took the opportunity to go be silly and touristy--we went panning for gems. It has actually been a bit of a running joke for a few years now, complete with a hand/arm motion mimicking the activity. But this time, we finally decided to just get out there and do it. And you know what? It was fun. It was silly. It was gimmicky. And getting out there and doing it was a bit of a remedy for some of the ailments of the day. We've yet to fully identify all of our treasures, but I think it's pretty safe to say that we are now bazillionaires with riches beyond imagination. No, no, stop--there's no need to be jealous. You know us, we will share the wealth, and all will experience an improvement. Remember that cold I mentioned the other day? I only had one rough night of it back then, but there is one lingering annoyance--the coughing. While I do admit that I do not particularly enjoy it, it seems to be even more bothersome/worrisome for everyone around me. So, now, I am taking OTC preparations that do not make a difference in my coughing, but my doing so seems to please others. Oh, well, that's just how it goes sometimes, eh? Since it is Small Business Saturday, and we were so close by, we popped into a yarn shop. It was quiet when I first entered the store with a lesson happening at a table, and busy by the time I left with some younglings (tweenies?) getting needles and yarn with grownups who seemed doubtful that any would stick with it. In between, I bought some beautiful blue merino/cashmere/silk fiber, a boat shuttle, and some bobbins. I considered just getting more of the fiber, but I decided to go ahead and get the weaving stuff instead. We also made it out for a bit of touristy sightseeing. We had read about the Greensboro Massacre and stopped by the marker. If you feel so inclined, you can read more (and see it, too--there is video) about it. We found the inscription on the sign rather lacking. Tomorrow promises to be a big day, starting with car-packing-Tetris. I'm not sure just how we will get it all arranged. I'm beginning to think volunteering to bring back someone's Costco list might have been a bit ill-advised. Ah, but we'll only have to travel with that for a few hours, and then we can rearrange the car again (and again). Yeah, I know many people are tired of turkey already, but I just can't get enough. I don't think it is just because we don't have access to the leftovers, either. 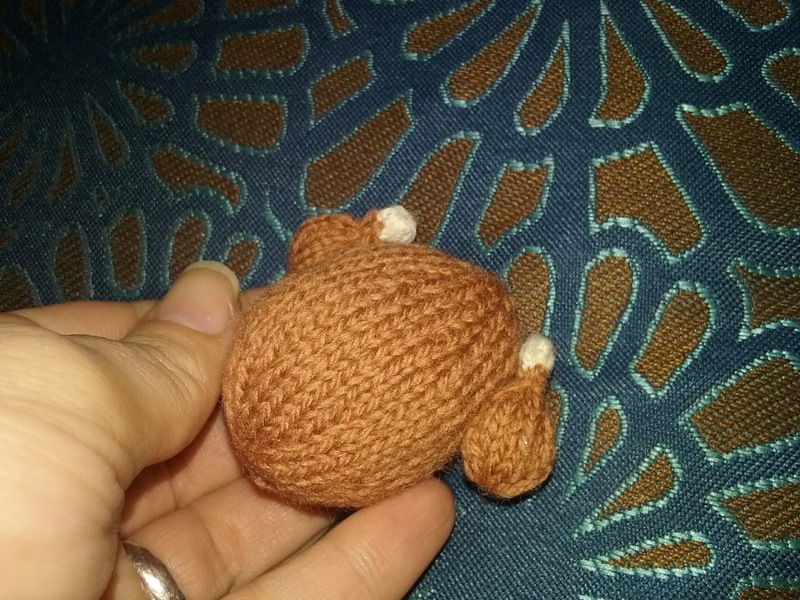 That being said, there are no leftovers here, so I am left with the knitting of tiny turkeys. There could be one more after this, but this is probably the last one. Now I just need to stealthily stick it on someone's refrigerator on the way out of town. Happy Thanksgiving to you and yours! I hope that giving thanks, today and every day, makes your life better. 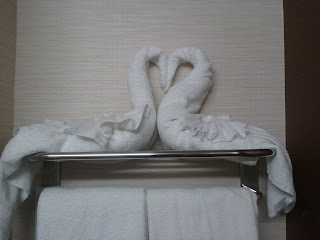 We've reached the point in our travels where we get to/have to stay in a hotel. I have mixed feelings about it all. But right now, I'm just glad to be off of the inflatable MRSA mattress (you don't want to know) and now only have to worry about waking Bruce with my coughing. All the rest, I just try to put out of my brain. Now, I'm going to try and put everything out of my mind and get some sleep. Yep, it's time to take a peek into my endlessly fascinating mind. Since I am not most excellent at the sewing machine, I am easily impressed when I do something and it turns out well, even if it is a simple sewing task. For example, I recently altered the length of my husband's overalls. I started with an old pair that he wears when working in the garage or when doing yard work, and when I didn't destroy those, I moved on to others. I'm pleased to have accomplished this task, and he is pleased with the changes. Not much of a story, is it? Since you stuck through my saga of simple alteration, I'll give you a bonus "Tale from the VA" story. On Halloween, Bruce had an appointment at the BVAMC. Before we left the hospital to go home, we grabbed a water and a coffee for the drive. Bruce is wearing overalls. A man approached and said, "Let me ask you one question." What followed was not what we expected, but instead was a series of brain teasers. He then began to talk about the coat he was wearing and all the places in the world he had worn it. Then he asked Bruce where he got his overalls. Bruce told him the name of the store where he bought them. Then he asked to borrow them. He said he just really needed to borrow them. We tried our best to just kind of laugh it off and make our way to the shuttle to the parking garage. Guess who else got on the bus a couple of minutes later. Usually, those buses are full and there is a line of people waiting for the next one. This time there were only five passengers--Bruce and I, one man in front of us, and the brain teaser and a buddy toward the back. Soon he started up again, asking to borrow Bruce's overalls. He then began to complain a bit more loudly that he couldn't believe that Bruce would not lend him the overalls. The man begins to make requests that the bus driver might drop him off somewhere besides the parking deck, which of course the driver cannot. All the way there (it is a short drive, but seemed longer) he would again express his dismay and disbelief that Bruce would not lend him the overalls. While having the bus nearly empty was not good in that he had almost nowhere else to direct his attention, it was good in that it allowed us a quick exit, and we did. You just never know what kind of adventure awaits you at the VA. I'm facing the perennial dilemma of the knitter preparing to travel--what yarn belongs in the bag and what should stay home. I know from past experience that I rarely knit as much as I think I will, but the danger of not having something to knit is not a good feeling. The fact that many a trip has come and gone during which I didn't pick up the needles once will not convince me to leave it all home. I have to bring something, even if it is only for the sake of magical thinking that it helps with traffic. C'mon, you at least secretly believe in it, too. So, I begin with the car knitting. That should be easiest, right? What requires a minimum of accessories, no charts, and an easily followed pattern. Large swaths of stockinette are always good for this. This is usually the easiest knit to decide upon in the packing process. Next, come two dilemmas--tiny knits and UFOs. I reason that the tiny knits are quick, don't require much yarn, something I enjoy making, and are nifty little gifts to leave as a little surprise to people we visit. However, if I haven't decided which tiny knits I will make, it means taking small amounts of many colors. Fortunately, I can carry the patterns digitally, so that doesn't take extra room. The UFOs are also tempting in that I tell myself that I will totally finish at least one when I'm away from home and the rest of the stash. However, sometimes the reason the project is unfinished is either some problem I have forgotten about and not yet solved, or I just don't like knitting it. However, if it is, for example, a pair of mittens, and I do finish them and have a need for them, well, it would be illogical to leave the project at home right? It's about this time that the travel knitting bag is overflowing, and I know I need to scale back a bit. I could make a decision, or I could just go about packing other things and pretend that I have plenty of time to figure out what is right. Or, maybe I should just leave the knitting at home and bring the EEW5 and some fiber. Afterall, I do have a car adapter and a battery pack, eh? At least that was what I was thinking when I was nearly finished making this tiny dish of mashed potatoes. It was a quick knit, assembly was easy, but it was iffy until I added the little pat of butter on top. The assembly and finishing details really do make a difference with these little knits. Blergh. I think I'm coming down with a cold. Actually, I hoped to be well in its grips by now so that I would already be on the upswing early next week. Now I'm hoping that it's not going to be much of anything and that by Monday this will not even be a memory because I'll be so busy. I have been doing a bit here and there. I've finished spinning what I would guess (ripped it in half and then that half in half, but no weighing, so, whatever) is about one-quarter of the fiber I started yesterday. I think I might even have some nice yarn when I'm done, but there's still a long way to go. My knitting isn't much to show. When I'm not working on the Featherweight Wrap to knit, I'm off in Mochimochiland, and as it is there unwritten, "Some assembly required." Oh, yeah, I need to find the rest of the pieces before I can begin assembly. Ahem. But maybe some medication is in order first. Yeah, I'm spinning. I needed to give the fixes on the EEW5 a go, and there's no other way to really do that than to spin. I'm trying to follow through on what I learned in my Stupendous Singles class, so it's all kinds of new around here. Maybe mixing together so many new elements isn't a good idea, but there you go. It's not going super-great thus far, but I'm just going to keep going and hope for the best. I really like this special fiber, and I want to make some nice yarn. Ta-to-the-dah! I finished the Twill Be Done weave-along. I tried something new and learned a lot. If you're on the fence about joining in on one of Liz Gipson's weave-alongs over on her Yarnworker site, I would encourage you to give it a go. I like the answer she gave about the schedule. Basically, she said that some people weave ahead, some follow the schedule to the letter, and some weave in their heads. For me, weaving the pattern helped me to learn even more, but I think I could have learned quite a bit weaving in my head. 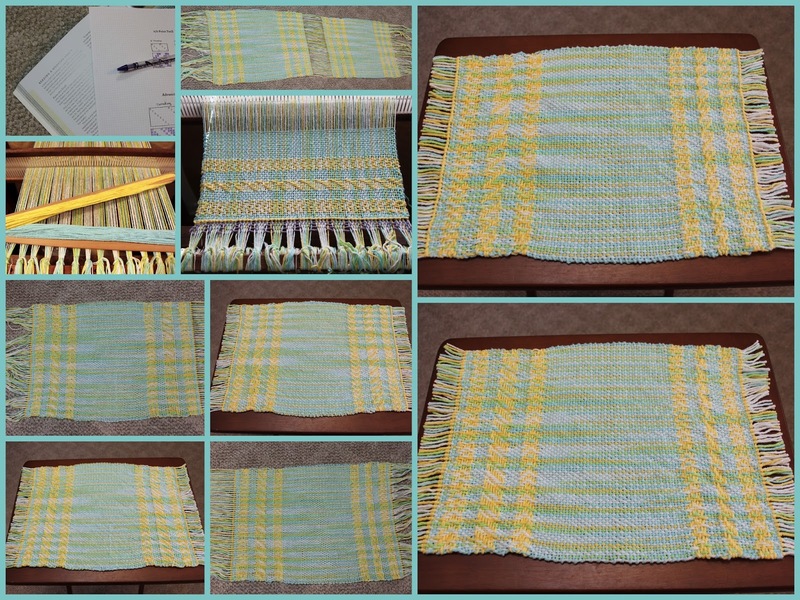 The pattern is for a table runner, but instead, I used my warp to weave two placemats because I think that it will get more use that way. I certainly see the errors and where I need to improve. I might want to try using a temple to help me with draw-in, or maybe more experience will be enough. The changes that happen throughout the process from having the woven piece under tension on the loom, to off the loom, and all the way through washing and drying cannot be underestimated. I like these pretty well. Now I just need to make the move from looking at them to using them. I'll Totally Finish This By Month's End, Right? I finally cast on for my NaKniSweMo Featherweight Wrap to Knit. It really was deciding the color that was holding me up on this. Making decisions like that has been an issue for me lately, but I went ahead and picked one so I could move forward with this. Then there was a brief interchangeable search. I did manage to round up several wayward interchangeable components and (somewhat) returned them to their proper home. Thinking back, I don't remember where the cable I was seeking had been hibernating, but I did find it. I could have begun the sweater without finding it, but eventually, it would be a problem to work the sweater on the short cable length I had used to knit the sleeves on the previous sweater. Anyway, I'm (barely) on my way. Impressive, no? I hope to curl up on the couch with the project and catch up on some shows, but this is a time of many interruptions around here. If I make a bit more progress, it could be a good companion to other goings on, but for now, it's fits and starts. One day, I will have a new black cardigan. I feel rather doubtful that I will finish this month, but soon I think I might have opportunities for some good knitting time, so there is still hope. I loved my first Electric Eel Wheel, (the fourth version) and I love my EEW5 even more. However, hiccups happened, but most were resolved quickly. One issue I faced along with other spinners, was that of wearing. Those spinning thinner yarn at a higher speed seemed to come across this issue more frequently. I noticed that it was happening on mine, but kept going, because I knew it would be fine for a while, and I wanted to keep spinning. Replacing hooks could be a bit of a patch, but not a good longterm fix, and that wasn't the only part with the wearing. The Ravelry group is great, and following the example of others, I used wire to wrap the hooks and other parts, and that helped, but again, it was a patch. It didn't stop me from spinning, and I have already spun wonderful yarn on my EEW5. I kept peeking in on the EEW group on Ravelry from time to time and knew they had been working on a solution. Maurice spent a lot of time problem-solving, and I received an email the other day to let me know that the replacement parts were ready. Now it is time to apply the fix. It's been a long time since I've played along with Unconscious Mutterings, but when it popped into my inbox, the time seemed right. Besides, nothing I'm working on is in a photographic state right now, so instead, you get to look into my endlessly fascinating mind. It's not looking great for the home team on the Twill Be Done piece, but I reserve judgment for now. I've made it through the twill-y bits and clove-hitch knots at the beginning and am now chugging along on the plain weave center portion. So far, I see a few problems, but some may be less problematic after finishing. Possible problem one is that I think my beating in the twill-y bits is not wonderful. I'm a little less concerned about that as things look different under tension. Also, I am learning something new, and that is likely to show. Another problem is that my twill-y bits didn't seem to show up very well so far. The color mix might not work well. I don't find it to be ugly, but rather unfortunate to go through the effort only to not be able to see it well. It actually looks better in this progress picture, I think, so maybe it's not so bad. However, looking at the picture, I'm pretty sure I also have some outright mistakes in my pick-up, but I'm moving on and just trying to get something done. Besides, that, it is going well, I think. 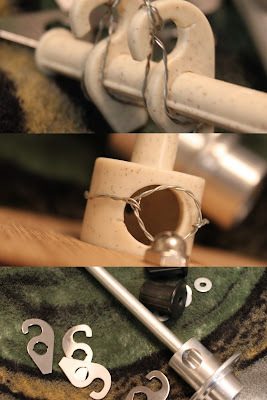 I had a nice rhythm going working the clove-hitch knots, and am glad to have learned another edge treatment. I might make placemats or towels instead of the runner. I guess I'd better check the warp length and make some decisions. After all that, the plain weave seems a bit boring now, and I'm ready to get back to the pick-up sections and see if I'm improving. Late Monday night the phone rang with news of a relative far away hospitalized in ill health. She's too far away to visit, so what to do? Well, I do the crafty stuff, so I guess I make. The problem is, I don't know just what to make. Maybe some little bitty things from Mochimochiland, like the Thanksgiving turkey and pie, or would something woven be better? What do you think--weird little stuff or something useful/practical? She definitely needs a new embroidered handkerchief or two. I'll finish adding the bamboo to the one with the panda. I'd like to get something to her soon, so I'd better hurry. I guess getting my NaKniSweMo on the needles will have to wait. Then again, if I cast on, I'll have it cast on, right? Guess I better decide on the color, eh? Which do you think I should choose? What? I'm not avoiding things. ...but catching up on sleep probably needs to happen first. Life has been very busy lately. If I cannot figure out a better way to take care of some of the new stuff on the list, I'm going to have to find a new way to do everything else. Until then, the "everything else" is suffering a bit. Today was a bit of a breather, and that was nice. I managed to tackle some things around the house, weave a little, and play with markers and pens a bit, too. Something else I thought would be good for today was watching weaving DVDs. My collection grew by two during birthday season, but I haven't had the chance to watch them. The problem is that when I sit down to watch most anything, my eyelids get very heavy. Since I'm trying to get my sleep schedule back on track, I am avoiding naps for now. That means I need to set these aside for now. I'll get to them eventually, and then I will be an expert, for sure, eh? Perhaps you noticed my stalling on the start of my Twill Be Done. You would be forgiven for thinking it was just a poor attempt at trying to stretch a small amount of content into several blog posts. Sure, that's certainly a plus, (ok, not the poor part, but that's kind of how it goes around here) but it's not what was happening. I was just trying to finish the last project and life was not cooperating, but I finally made it happen. I now have a new cloth for the coffee table, and I think I like it. It was also nice that I finally got around to using the 15 dpi reed, and although I do need to try out some different, smooth yarns with it, that will have to be later. Anyway, I finally have the warp on the loom. After the last project, setting this up with the 7.5 dpi reed seemed super-quick. I hope to get weaving on it soon, but for now, it must wait and wonder whether the colors will work. I really don't know if they will, but I've made it this far, and I'm going for it. 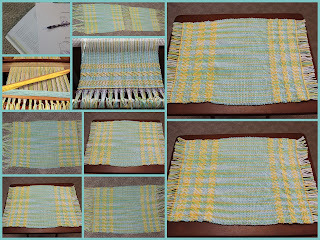 The blue will be the main weft and the yellow will be the twill-y bits and clove-hitch knots (yes, more new stuff!). My picture is still a bit off on the color, but not by tons. Really, it's the variegated warp that has me wondering, but worse case scenario, I only learn new things and have ugly cloth. Stacked up against everything else in life, how is that even a concern, eh? That's right, I'm sleep-deprived and suggestible, so I'm NaKniSweMo-ing it, and so is Stacey! I'm making another Featherweight Wrap to Knit. Now I just need to decide the color and get knitting. Should it be black, beige, or purple? Of course, I need some sleep first, or counting all those stitches to cast on just isn't going to work out well. 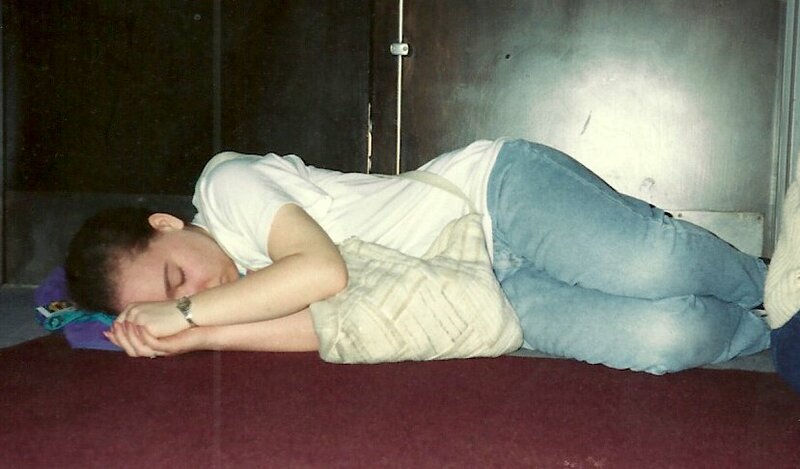 Night-night, all. If you have time, please put my yarn, pattern, needles, and stitch markers in a project bag and set it next to my purse. Tomorrow starts early and will be long. I finished a sweater last month. Yes, I finished it last month, but I started it way back when--January 25, 2015, to be precise. After I picked it up to work on it, I was pleased to discover that I could figure out where I was in the pattern and just how close I was to finishing. I was most of the way done with one sleeve, and then all that would be left was the second sleeve. Upon binding off that first sleeve, I was free to try on the cardigan without the entanglement of needles or trailing a ball of yarn, and I felt good about it. It really was inspiring. Then we had some cooler weather, and I wanted to finish it so I could wear it. The closer I got to completion, the more I thought about knitting this pattern again in this same yarn in other colors. I considered small modifications. I even thought about NaKniSweMo-ing it. That thought didn't last long, though, but I do have a new sweater. Of course, now that it's done, we have a warm-up and increased humidity, but that happens. I'll have plenty of opportunities to wear this sweater in comfort, but I didn't wait for that to attempt a photo shoot for it. I just kept setting the timer on the camera and posed over and over and hoped that something would turn out alright. By the time I came in, I had taken 336 photos, and I didn't like any of them. However, the Google Photos Assistant created an animation from some of the photos, so that's what you get. I think this cardigan will work well for me. I like the way it fits through my armpits. I'm weird that way. I may not really be describing it right, but I just do not like clothing stuck up in my armpits. There is a similar (both in name and appearance) cardigan pattern that was popular a few years back, and I really wanted to knit it, but it seemed like it would do that, and I don't think my body shape/size was a good fit for it either. Anyway, I was glad to find this pattern, because I would like a few cardigans in the wardrobe. This is a nice, basic pattern, and I can think of some simple modifications I might make if I were to knit it again, such as changing the length and perhaps decreasing a bit more on the sleeves. If I feel really adventurous, maybe one day I'll spin to knit one. When the birthday girl is this sweet, going to a birthday party at the infamous children's party place doesn't bother me a bit. As I mentioned previously, I'm participating in a weave-along over on Liz Gipson's site, Yarnworker. We are weaving Twill Be Done from Handwoven Home. Some of the terminology and skills were intimidating to me when I read the description, but the opportunity to learn grabbed me. The first bits were simple--things I already knew. Then I began to feel rather stupid. It was time to learn to read a draft for a floor loom and create a drawdown chart. I knew what the first thing was, in that I had not really understood how to do it and only felt more confused each time I tried. The second thing could have been anything, but I hoped to learn. When it came to reading the drafts, it all seemed counterintuitive, upside down, and backwards. Now might be the time to confess my rather poor sense of direction. I think there is a connection. Finally, after several viewings of the video lessons and reading of the passages, I think I had a breakthrough. 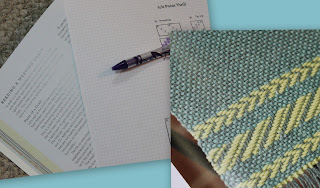 Once I understood that the drawdown is like a charted representation of what the weaving pattern will look like--kind of like a colorwork chart, I was on my way. Then I had to get out of my head and try to just follow along step-by-step without understanding what I was doing. About halfway through the first twill pattern, I could follow what I was to do, and then coloring in the next was a breeze. I like the relaxed format of this weave-along and feel like I can keep up with each week without too much pressure. We'll see what happens--next week looks to be a doozy. Here we are, the new month is already rockin' along, and I haven't set my goals just yet. I guess I'm still recovering from October. To help me through the transition, I'm trying to relax a little bit more, and that means getting my mind to move in a different direction. Anyway, one night I followed a link (somewhere on twitter, I think) over to Amazon, and clicked around there for a while, and next thing you know I had added a book to my wishlist. I've found doodling to be helpful sometimes when I am trying to calm, focus, or re-direct my brain a bit. I have some nifty pens and pencils, and even some Zendoodling books, too. Now, thanks to my brother, I have this new book. So, sometimes at night before bedtime, I flip through the book and try drawing some things, and occasionally I even color them. I'm not likely to become super-skilled, and while, in a dreamy, fantasy way I would like to be, that isn't the point. In fact, it likely has no other point than just doodling. I'm not creating anything for any particular purpose--just something I'm doing sometimes. It's a nice way to relax, get ready to sleep, or just play. To Bamboo, or Not To Bamboo--Is That Really a Question? Well, I've finished a sweater, don't feel like picking up Bridgewater, and the weather has turned a bit bleh, so knitting just isn't really doing it for me. My inspiration is running a little low. That can have many causes, but I think a need to straighten and organize is tops on the list this time. So, I've been doing a bit of that. Sometimes I get a bit messy when I'm in the midst of things, and that's why I have the same cycle of tidying/creating/messiness repeating. It's not ideal, but I do find ways to make it work better for me. When I'm feeling a bit meh about creating, I can clean without taking time away from some project I'd rather be doing. It also prepares my space for when I am ready to go again and helps me find things. The other helpful part is rediscovering things I haven't thought about in a while. It's kind of like the magic of shopping in your own stash. In between organizational sessions, I'm weaving. Once I did the hem-stitching at the beginning of this piece, I was able to get rolling with the weaving, and I think I'm probably somewhere around the halfway point, so that's good. I think I've decided on the yarn for the Twill Be Done Weave-Along. I'm having a little trouble focusing on the new-to-me terms associated with this, but I'll get there. All of that is well and good, but it doesn't help me with the need to have something to do while I'm sitting on the couch watching television. So, embroidery, yeah? That's what I'm thinking. I stitched a panda on a handkerchief, and I could start a new handkerchief, but I'm thinking of some bamboo on the opposite corner. What do you think? Yes, October is over, and what a month it was. We had computer troubles, and now we have a new computer. We will probably attempt to repair the old one, but even if we have success with that, it is probably good that we bought a replacement, as the old computer seems as though it really doesn't intend to be a computer full-time for years on end. We'll go ahead and totally blame my lack of blogging on the computer woes, but we both know that really is not the truth. We had medical adventures, oh, so many planned and unplanned medical adventures. Bruce has been doing OT for a sad rotator cuff and PT for sad hips. He got a painful injection in his hand to help a trigger finger. All that and a few regular appointments were all planned. Then the unplanned kicked in for real. Bruce had a new experience--sleep paralysis. That was brought on by chest pain during r.e.m. sleep, and that took us to the hospital, which brought us a couple of medication changes, future testing, and doctor appointments. After all of these years with the heart trouble, it's kind of funny how so many of these visits go. The doctors' assessments seem to often line up with something along the line of, yes, this was something to do with your heart, but you're in no more danger than usual with it and there is not anything we need to do, you may or may not have needed hospital monitoring in this instance, but you need to come in each time this happens because it could just as easily have been a deadly thing. This is the second such hospitalization this year, and even the docs can't really agree on anything other than the usual lifestyle advice. You know how it goes; follow the diet recommendations, take your meds, be active but not too much, and follow up as needed. Lather, rinse, repeat--it's not just a hair care regimen. I've also embroidered, woven, sewn, and knit. I either finished a handkerchief or just need to add a little something in the other corner. The weaving was not to completion, and I need to get to it because I need that loom free. The sewing was little baby doll dresses that went to my niece, but I never got pictures. As for knitting, I finished a sweater (just need pictures) and made good progress on the Bridgewater. Does my writing seem more experienced, mature, and nuanced? No? So you're saying I just look older, right? I guess since my birthday is over, I can't expect everyone to be nice all the time, eh? Yes, I had a birthday last month. Many thanks to the many people who remembered and helped me celebrate. I really had some awesome birthday-ness. I will be playing with my new toys for a long time. Looks like I'll be starting with the weaving, as I have a weave-a-long over on the Yarnworker site, and I'm already behind.